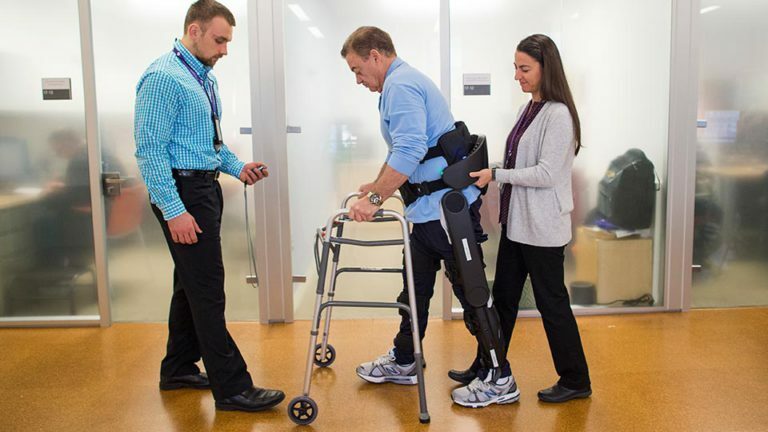 Treatment of Spinal Cord Injury- A spinal cord injury causes damage to the spinal cord which is an extremely serious type of physical trauma that’s likely to have a lasting and significant impact on most aspects of daily life. The spinal cord is a soft bundle of nerves that extends from the base of the brain to the lower back. It runs through the spinal canal and is protected by the bones of the spine (vertebrae). Messages between the brain and the nerve roots travel up and down the spinal cord, making it possible for the brain and body to communicate. The sensations, pain and the movement we are able to do, are all because of the signals passed on through the spinal cord. Spinal cord injuries can be complete in which the signals won’t be passed on below the point of injury or incomplete in which one will have restricted movement and sensation below the point of injury. 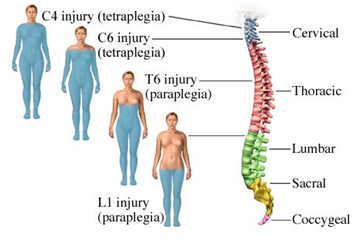 Spinal cord injury may result into Paralysis, Inability to move arms or legs, unconsciousness, loss of control of the bladder or bowels, headache, pain, pressure, stiffness in the back or neck area, signs of shock, an unnatural positioning of the head. Intramedullary tumors: Tumors which originate from inside of the spinal cord cells for e.g. astrocytomas or ependymomas. Extramedullary tumors: Tumors which initiates in the adjoining network of spinal cord cells that can affect the spinal cord for e.g. schwannomas, meningiomas and neurofibromas. Spinal tumors causes neurological problems which in future can be life-threatening or may cause permanent disability. Spinal MRI, CT scan and biopsy are the tests that can help confirm the diagnosis and locate the exact position of the tumor in the spine. Treatment for tumors includes surgery for removal of the tumors with an acceptable risk of spinal cord or nerve injury damage, radiation therapy to eliminate the remnants of tumors that remain after surgery and chemotherapy to destroy cancer cells or stop them from growing with the use of medicines. Application of stem cells post surgery of the tumors can be effective in improved vascularization. They stimulate the microenvironment, cytokines, resident stem cells and the injected mesenchymal stem cells to boost healing processes such as inflammation, repair, and remodeling due to secretion of growth factors. Through conventional anti-inflammatory medicines, it is impossible to completely cure spinal injuries and these medicines can affect the other vital organs of the body due to continuous hormonal modifications. Stem cell therapy offers great potential in the field of Spinal cord injury treatment as it can help in replacement of nerve cells, remyelination of axons (to create new myelin sheaths on axons), preservation of glial cells, and increased trophic molecules (to facilitate the growth of the axons and dendrites). Stem cells also have the ability of angiogenesis (formation of new blood vessels), bridging of cavities, reducing inflammation, and stimulation of nerve cells for neuronal plasticity (the ability of nerve cells to change in form and function in response to changes in their environment). 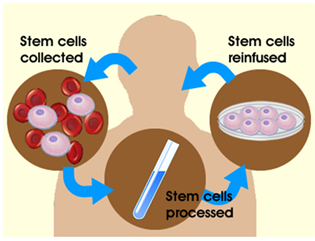 The stem cell therapy focuses on delivering the sufficient number of Adult Autologous Stem Cells extracted from one’s own bone marrow or adipose tissue to the injured area for better healing and regeneration of the desired cells. In bone marrow, the stem cells are extracted from hip bone or iliac crest after general anesthesia and in adipose tissue, the extraction is done from belly area with local anesthesia. The extracted cells are processed to be enriched with the pure line of stem cells and re-injected into the patient either by intravenous (infusion through the vein) or intrathecal (infusion through lumbar puncture) injections. This treatment reassures the safety of the patient with promising results. As the traumatic spinal cord injury has the most devastating outcomes, rehabilitation of these injuries has an increasingly important role. 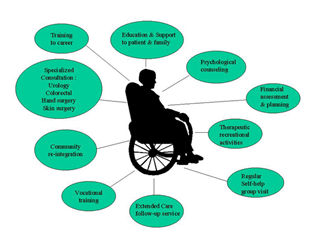 The primary goals of rehabilitation are the prevention of secondary complications, analysis of recovery of motor, sensory and all the bodily functioning, psychological support/counseling for depression, mood swings or anxiety etc. and reintegration into the community. For these purposes, post-treatment the patient is asked to visit the doctor after a specific period of time. The severity of the injury in the spinal cord and the protocol which is best suitable for the treatment decides the overall cost for the stem cell therapy for spinal injuries. The treatment requires a minimum of 21-45 days in India. Benefits of stem cell therapy for spinal treatment includes: increased activity, increased productivity at home and at work, improved mood, less need for pain medicines with no side effects or adverse effects and better physical fitness. For further queries on Treatment of Spinal Cord Injury, feel free to ask in comments.